This page examines skin cancer and its natural treatments based the critical functions of pancreatin enzymes and natural killer cells. An explanation of cancer dating from the early 1900's is updated here that leads directly to many natural skin cancer treatment and prevention strategies. It also harmonizes with modern research findings and established cancer risk factors. The most common explanation for the cause of skin cancer is that it is the result of damage from excessive sun exposure. This simple explanation is insufficient and results in ineffective prevention advice and treatments that do not address the causes of the disease. The approach presented here looks at skin cancer for what it really is, a cancer of the skin. That may not sound like a much of an improvement over regarding a lesion as a skin problem to be lopped off, but a natural medicine approach to enhancing the immune system offers a much better long term prospect for optimal health compared to managing skin cancers through surgeries. This chart tells a clear story regarding the cause of skin cancer. Melanoma, basal cell carcinoma, and squamous cell carcinoma are the three most common types of skin cancer. All three skin cancer types have similarly shaped graphs of incidence statistics that show steady increases since about 1950. If skin cancer were caused only by ultraviolet (UV) light, we would have to make the absurd conclusion that people were very consistently increasingly reckless every year towards its dangers. A much more likely explanation is that skin cancer is caused by a combination of UV light and dietary factors such as excessive consumption of polyunsaturated fat. By the way, whatever happened to that 1940's sunscreen? Although modern cancer research has been somewhat fruitful, important findings are slow to be incorporated into treatments. A key reason for this is that a plausible model has never been established, accepted, and communicated by conventional medicine. An alternative explanation of cancer is presented here that harmonizes with modern research findings and established risk factors. This leads directly to many simple skin cancer treatment and prevention strategies presented later. (I) The presence of a certain type of cell that becomes genetically damaged. In the cases of squamous cell carcinoma and basal cell carcinoma, this damage may result from excessive sun exposure. (II) The presence of hormones associated with pregnancy. These hormones stimulate a cancerous cell to multiply itself repeatedly, resulting in tumor growth. (III) A deficiency of active pancreatic enzymes produced by the pancreas. These enzymes circulate in the blood to selectively destroy cancerous cells along with specialized white blood cells known as natural killer cells. The cells that become damaged in cancers are germ or stem cells that occur a rate of roughly 1 for every 10,000 normal cells in the skin. The typical human body probably has billions of stem cells out of an estimated 10 to 100 trillion total cells. The purpose of these stem cells is ostensibly to provide the capability to repair damage that occurs and possibly to isolate embedded pathogens from normal cells. Stem cells in the skin are concentrated under hair follicles. Lighter skin suffers more damage from the same amount of sun exposure than darker skin. Because of these relationships, the observed higher skin cancer rates for people with fair skin and red hair is probably due to the unique genetic coding and greater vulnerability of those stem cells. Stem cells have received attention recently because they can be genetically manipulated to become other types of cells, such as in cloning experiments. Stem cells are capable of dividing and renewing themselves for long periods. Unlike muscle cells, blood cells, or nerve cells  which do not normally replicate themselves  stem cells may replicate many times. When cells replicate themselves many times over it is called proliferation. A starting population of stem cells that proliferates for many months in the laboratory can yield millions of cells. Some type of damage or disease is normally needed to initiate this proliferation mode. The initiation of the proliferation mode depends on both when and where the damage occurred in the cell's DNA so that a long period of time can lapse between the damage event and the onset of proliferation. This explains why severe sunburns in childhood can lead to skin cancers much later in life. In the case of cancer, the genetic damage induces the stem cell to become a variant of a trophoblast cell. Layers of trophoblast cells are used exclusively in pregnancy to surround a fertilized egg. Their short-lived role in pregnancy is to attach to the uterine wall using tiny protein pieces as hooks or tentacles and provide a path of nutrition to the developing embryo from the mother's normal cells. Cancer is simply trophoblast-like cells growing in inappropriate locations. Photographs of individual cancer cells reveal their tentacles that can clearly be seen in scanning electron microscope pictures. 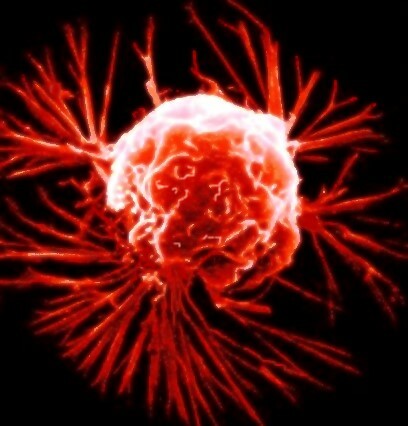 Artist's rendition of a breast cancer cell showing the tentacles. Trophoblast cells are also precursor cells of the placenta (afterbirth) which is expelled at birth. This changeover is called differentiation, a term that also arises in cancer where malignant cancer cells can transform into much more normal cells. What happens if trophoblast cells are physically relocated to other areas of the body? In a recent (2002) study involving mice trophoblasts, Harvard researchers performed this experiment and found the trophoblast cells can either grow uncontrollably in their new locations or quickly die, depending on the capability of the immune system and specifically of natural killer cells. These specialized white blood cells are usually fairly plentiful. Natural killer cells normally comprise about 15% of the all white blood cells. The trophoblast cell responds to the hormones of pregnancy like estrogen and growth hormones that stimulate it to grow, divide, and multiply. A tumor then forms that metabolizes food from the blood supply of the normal tissue where it is attached. In a real pregnancy, the baby's pancreas develops and the enzymes it produces largely dissolve the trophoblast cell attachment when it is no longer needed. The main side effect of the dissolving process in pregnancy is a nauseous feeling known as "morning sickness". The concept that the dissolving of the trophoblast adhesion is the cause of morning sickness in pregnancy is still not widely recognized. However, this explanation precisely fits the timing and symptoms of morning sickness as noted by the Scottish embryologist Dr. John Beard (1857-1924) of the Edinburgh University Medical School in the early 1900's. Beard was the first to connect the dots between the trophoblast cells of pregnancy, cancer, and pancreatin enzymes. Beard confirmed the efficacy of pancreatin enzymes on cancer tumors. He did this by injecting enzymes directly into tumors. As expected, the injections resulted in the tumors shrinking in size and produced side effects consistent with morning sickness due to the dissolved wastes that must be detoxified by the body. Trophoblast cells are designed to be killed by high doses of pancreatin enzymes. They are also susceptible to be killed by natural killer cells. What happens if these mechanisms fail to destroy the trophoblast cells in pregnancy? There are still chances for apoptosis (programmed cell death) or differentiation (transforming into more normal cells). But if all these mechanisms (and others not mentioned) fail, we get a condition known as Gestational Trophoblastic Disease (GTD). GTD can develop into a very malignant cancer called choriocarcinoma. The relationship of the trophoblast cell to a cancer cell is important because they share common characteristics. First we can understand why damage of a stem cell can initiate the cancer process because the trophoblast is a relatively simple mutation of a stem cell. Next we can understand from the pregnancy connection why certain hormones stimulate cancer growth. Finally, we can see trophoblast and cancer cells share normal causes of death. The most significant natural healing mechanisms available to dissolve the attachment we call cancer are pancreatin enzymes and natural killer cells. The natural killer cell system is very powerful and can be optimized by supplementing a combination of inositol (vitamin B11) and inositol hexaphosphate (IP-6). These nonprescription nutritional supplements have been shown to be effective against every type of cancer tested in worldwide research, and have demonstrated benefits in other diseases and disorders as well. The initial findings on inositol and IP6 were reported in the mid 1980's by Dr. Shamsuddin at the University of Maryland Medical School. Although controlled human studies have not been completed, extensive animal studies have demonstrated the safety and effectiveness of IP-6 and inositol as a treatment for cancers with minimal side effects. Polysaccharides, found in plants such as aloe vera and certain mushrooms (notably agaricus blazei murill (ABM), shiitake, maitake, and reishi), have also been shown to significantly increase natural killer cell production. Still another natural killer cell booster is melatonin, a hormone produced by the pineal gland during sleep. It is also available as a dietary supplement. Of course, cancer afflicts both men and women despite requiring "female" hormones. This is because even males have a plentiful supply of female hormones. In addition to occurring naturally, they abound in our food supply from many sources including meats and dairy products. Estrogens are a female hormone group that is one of the most active in stimulating cancer growth. There are actually about 40 variations of estrogen in the body, some are more stimulating than others to cancer growth. Chemicals in cosmetics and even sunscreens may also have estrogenic properties. Pancreatin enzymes have two important functions in the body: digestion of foods and routine cancer eradication. Pancreatin is a mix of different enzymes, and those involved in the digestion of proteins are also used to eliminate cancers that occur throughout the body. Mutations occur not infrequently in the body, but are normally destroyed by activated enzymes manufactured by the pancreas. Only when the amount of pancreatin delivered to the mutated cells is insufficient to "digest" them does the cancer have a chance to thrive. In the case of basal cell carcinoma and squamous cell carcinoma, ultraviolet exposure from the sun, exposure to various toxins, pancreatin unfriendly cosmetics, or an acidic body chemistry may create damage and mutations that eventually overwhelm this healing mechanism or interfere with it. What are enzymes and how do they work? Enzymes are molecules made from protein that facilitate or speed up certain chemical reactions by making temporary bonds with their reactants. Enzymes can be considered catalysts because they are not consumed or changed as a result of these chemical reactions. A good analogy to help understand enzymes is to consider them as tools. Just as different sized nuts and bolts require precisely sized tools to loosen and tighten them, the body utilizes hundreds of different enzymes to perform specific tasks. Like tools, the precise physical shape of enzymes is critical to their function. Enzymes can be gummed up or deactivated by bonding to other molecules. Enzymes can be warped or destroyed by damage from heating (cooking). Even the low heat of pasteurization is enough to destroy many enzymes present in foods. Enzymes typically are effective only over a limited acid-base pH range. Consuming protein rich foods at inappropriate times or in excessive amounts can result in a lack of pancreatin enzymes available to fight cancers that occur. Because protein digestion shares the use of the same enzymes (particularly trypsin and chymotrypsin) used to fight cancers, the body needs a time span each day approaching twelve hours or more without protein consumption for its cancer defense mechanism to work optimally. Especially in the past few years, proteins are often looked upon as super healthy in any amount, if not by default because fats and carbohydrates have been vilified. People are eating more protein more often. It turns out the body needs about six hours to digest proteins. The body also needs several hours after that to use the pancreatin it produces to destroy naturally occurring cancers. Graph showing historical trends of meat consumption in the US over the past century. The rise in total meat consumption (red line), primarily driven by poultry, has coincided with the rise in skin cancer incidence. Modern farming practices and a shift away from consuming organ meats that supply enzymes may also have impacted cancer incidence rates. Data source USDA. Poor diet choices and eating habits can tie up pancreatin enzymes with digestive tasks so that their cancer elimination capability is reduced. For treating and preventing cancer, minimizing the amount of time pancreatin enzymes are devoted to digestion is important. Pancreatin enzymes come into play in digestion after the food has been chewed and then bathed in stomach acid. Compromising these preceding digestive functions may force enzymes to take longer to finish their job. For example, diluting stomach acid by consuming excessive water or taking antacids with meals makes the stomach acid less effective. Incompletely chewing food, eating too much food, or eating too frequently can also be expected to increase the demands made on pancreatin enzymes for digestion. In general regarding stomach acid for digestion, stronger (lower pH) is better and its function should not be compromised as it performs its job. In order for the pancreatin healing mechanism to work, the pancreatin must be both present and "activated". Cancer cell membranes have protruding hair-like strands made of carbohydrate that can block the physical access of trypsin and chymotrypsin to the exterior proteins. Activation means also supplying enough carbohydrate dissolving amylase enzymes to dissolve the strands so that trypsin and chymotrypsin can be effective. John Beard first recognized the importance of including these amylase enzymes in effective cancer treatments. There may be other elements to activation as well. The compound urea, for example, breaks up the surface tension of the fluids surrounding the cancer cell allowing better access by digestive enzymes to its surface. A few words are necessary regarding protease inhibitors, a new class of drugs used to fight both HIV (AIDS) and cancer. Proteases are enzymes in the pancreatin enzyme mix that help to break down protein into amino acids and peptides. The fact that these drugs are successful in slowing the growth of cancer would appear to put a snag into this theory of using pancreatin enzymes to kill cancer cells, but both approaches are viable because they work on different mechanisms for cancer. Protease inhibitors slow down the growth of established cancer tumors by preventing them from manufacturing new tentacles from the available protein they ingest. This prevents the cancer cells from physically hooking into normal cells and therefore the blood supply for nourishment. Other methods such as radiation, chemotherapy, or surgery are required to actually kill the cancer cells. Protease inhibitors can at best manage the disease for a period of time. They exacerbate an already enzyme depleted condition and will not likely lead to permanent healing. Of course, protease inhibitor use is incompatible with the use of pancreatin enzymes to overwhelm and break up the cancer cells, and vice versa. Cancer fighting pancreatin enzymes are ineffective in an acidic environment. It is instructive to first look at how these enzymes are used in digestion. Most people are probably aware that the stomach environment is acidic. Further downstream that acidity is neutralized by alkaline pancreatic juices containing enzymes ducted to the small intestine from the pancreas. This creates a non-acidic environment that enables the pancreatin enzymes present in the fluid to be effective for digestion. In particular, the pancreatic enzyme trypsin is most effective at a pH of 8.5, whereas stomach acid pH typically is in the 1.0 to 2.5 range. A non-acidic or alkaline environment is necessary for pancreatin enzymes to fight cancer. These enzymes are likely best absorbed into the blood for cancer control during periods of fasting or sleep. A diet comprised mostly of refined foods and meats may result in metabolic acidosis that depletes pancreatin enzymes or diminishes the ability of the pancreas to produce alkaline digestive juices. The adverse effects of an acidic body chemistry stressing the pancreas could perhaps also lead to troubles with insulin production, insulin resistance, and diabetes. An acidic drinking water supply, for example, has been shown to result in increased risk for diabetes. Chronic infections, such as from gum disease or parasites, could be expected to sap the capabilities of natural killer cells against cancer. A very independent researcher, Dr. Hulda Clark, has proposed that a combination of parasites (infection rates of up to 95% of the population) and pollutants (especially propyl alcohol for cancer) are a primary cause of many diseases. Propyl alcohol is also known as isopropyl alcohol, rubbing alcohol, propanol, or isopropanol. Because of the widespread use of isopropyl alcohol as a disinfectant and solvent, it also contaminates many processed foods such as cold cereals. Common body products that may have isopropyl alcohol in them include cosmetics, deodorants, shampoos, hair loss remedies, hair sprays, mouthwashes, mousse, body lotions, and shaving supplies. It takes about five days to eliminate isopropyl alcohol from the body after exposure is stopped. So why is isopropyl alcohol potentially bad? According to Dr Clark, it allows a normally harmless intestinal parasite (the intestinal fluke) to complete its life cycle outside of the intestine. The body responds to this parasite in a similar manner as exposure to the tuberculosis bacteria by attempting to surround the parasite with a tumor to isolate it. Other researchers have suggested that if this parasite and/or tumor material then becomes infected with a virus (the Bx virus or the By virus), the tumor growth suppression mechanisms become defective, resulting in the uncontrolled growth we call cancer. The By virus is said to be associated with carcinomas. Of course, the two most common types of skin cancer are basal cell carcinoma and squamous cell carcinoma. Specific details are given in Dr. Clark's books for making effective parasiticides to eliminate parasite infections using black walnut hulls, wormwood, and cloves. Dr. Clark has also described a battery powered electronic circuit that can be built for less than $20 using parts available at Radio Shack. Known as a zapper, this circuit is said to kill the parasites that bog down the immune system. Dr Hulda Clark's book and zapper information are available for free on the internet. Sugar feeds cancer. Glucose is the primary fuel of cancer cells. Nearly all carbohydrates ingested in the diet are converted to glucose following transport to the liver, but sugar consumption results in markedly higher glucose levels in the blood. Reducing blood glucose levels is an important step towards controlling cancer's ability to thrive. This is most straightforwardly done by reducing sugar, refined flour, and white rice intake. Steps to reduce insulin resistance, such as supplementing chromium or including cinnamon in the diet, should also help. Cravings for foods with high sugar content can result from cancer's insatiable appetite for glucose. Cancer cells metabolize glucose inefficiently and generate acidic wastes. Normal cells usually metabolize glucose aerobically (with oxygen) which results in a clean, efficient burn. Some cells can burn glucose anaerobically (without oxygen) when under stress such as during intense exercise. Cancer cells are only capable of metabolizing glucose anaerobically. This anaerobic burn is much less efficient in terms of energy release and also generates substantial acidic byproducts. The extra acidity can compound an already bad environment for pancreatin enzymes. Interrupting the glucose metabolism (glycolysis) of cancer cells is the subject of current research because it can lead to apoptosis (cell death) without harming normal cells. One mechanism employed is to get the cancer cell to ingest lots of calcium which shuts down the glucose metabolism. Another promising mechanism uses acetic acid (vinegar) and citric acid to inhibit the activity of a key enzyme that regulates glycolysis called phosphofructokinase. Combined with a low carbohydrate diet, this helps to shut down the process of glycolysis in cancer cells and can lead to apoptosis. Another common sugar, fructose, is metabolized by cancer cells differently than glucose. Fructose provides the raw materials for cancer cells to make more DNA, which cells must do in order to divide and proliferate. The metabolism of fructose also increases uric acid production. Uric acid is associated with arthritis and gout. One of the hallmarks of cancer is inflammation. This is especially noticeable with skin cancer because the inflammation results in the all too familiar red lesions. Inflammation can be good or bad depending on the condition and capability of the immune system. Inflammation increases access to the cancer by the immune system and can mean the cancer is being effectively engaged. The bad side of inflammation is that it is integral to the cancer growth cycle and can prevent normal "programmed cell death" or apoptosis from occurring. Two enzymes involved in the inflammation process that generates histamine are cyclooxygenase-1 (COX-1) and cyclooxygenase-2 (COX-2). Many types of cancer cells rely on the COX-2 enzyme in their metabolic cycle. Blocking or inhibiting the COX-2 enzyme can significantly disrupt the growth of cancer. For skin cancer treatments based on pancreatin enzymes, inhibiting the COX-2 enzyme is a way to buy time while improving the capabilities of the immune system. Numerous medicines such as antihistamines, NSAIDs aspirin and ibuprofen (Advil), and acid reducers cimetadine (Tagamet)) can block the COX-2 enzyme, although many block both the Cox-1 and Cox-2 enzymes. The COX-1 and COX-2 enzymes do have otherwise useful purposes. COX-1 enzymes aid the important function of protecting the lining of the stomach from acids. The COX2 enzyme is involved in the production of stomach acid which ultimately aids pancreatin enzymes by helping to digest food. Therefore, inhibiting the COX2 enzyme could potentially interfere with the function of pancreatin enzymes in eradicating cancer. Applying COX-2 inhibitors topically directly on skin cancers is one way to minimize their adverse impact on the stomach lining and stomach acid production. I think most COX2 inhibitors can be a temporary help, but a strong inflammation response is eventually required to heal skin cancers naturally. As a defense mechanism, the body releases an inflammation promoting substance called tumor necrosis factor (TNF) that is capable of directly killing cancer cells. Some types of cancer cells can manufacture NF kappa B, the antidote to TNF that renders it harmless. Tumor necrosis factor then becomes counterproductive because NF-kappa B leads to COX-2 expression, which cancer needs. The best solution is to disrupt NF-kappa B rather than inhibit either TNF or the COX-2 enzyme because this can result in killing the cancer and not just slowing down its growth. OK, which is less healthy for cancer: butter or margarine? Polyunsaturated fats found in margarines and vegetable oils lower cholesterol levels but have been found to significantly increase cancer risk in a large 1998 study. Consumption of monounsaturated fat (found in olive oil and macadamia nuts) decreases cancer risk, and saturated fat was found to have no effect on cancer risk. The most common polyunsaturated fat, linoleic acid, has been fingered as a cancer promoter in several other studies. Linoleic acid presents a paradox: it lowers total cholesterol but is associated with increasing rates of cancer and inflammatory and cardiovascular diseases. Graph showing historical trends of food consumed in the US over the past century. The dramatic rise in polyunsaturated fat consumption (red curve) has coincided with the rise in skin cancer incidence, as well as other cancers and heart disease. As a reminder, skin cancer incidence rates were very low in 1909 through 1950. Data source USDA. Although total fat consumption has not changed significantly over the past century, there has been a tremendous shift from saturated fat consumption to polyunsaturated fat largely because we have been told it is healthier. One hundred years ago, cancer rates were very low. The human body's fat make-up is about 55% monounsaturated, 42% saturated, and about 3% polyunsaturated fat. We really need very little polyunsaturated fat in our diet. Modern diets can contain as much as 30% of calories as polyunsaturated oils. The best evidence indicates that our intake of polyunsaturated fats should not be much greater than 4% of the caloric total. The theory behind the increased cancer rates is that polyunsaturated fats can displace saturated fats in cell structures. The problem with polyunsaturated fats is that they are unstable. Especially when located in skin cell structures, polyunsaturated fats would be easily damaged by contact with oxygen or by ultraviolet light from the sun, forming what are known as free radicals. In turn, free radicals are known to be able to damage the cell's DNA. This genetic cell damage, blamed on the sun but more appropriately due to excessive polyunsaturated fat in the diet, leads to skin cancer. Another purely unhealthy type of fat is the result of high temperature processing of unsaturated fats to make them stable, known as trans fats or hydrogenated fats. Trans fats are like folding chairs locked in the stacking position. They are worthless in terms of nutrition. Trans fats are incorporated into cell structures, but because of their shape they are not permeable to oxygen and nutrients. The result is inflammation, more free radicals, less flexibility in cell structures such as arteries, and lesions that form to isolate the improper cell structures from the rest of the body. Americans consume on average approximately 6 grams of trans fats per day. The major sources of artificial trans fat in our diets come from cakes, cookies, crackers, margarine, fried foods, snack foods, and shortening. Completely avoid hydrogenated fats. Graph showing historical trends of shortening use as an indication of trans fats consumed in the US over the past century. Trans fat is clearly detrimental to health and has been consumed in increasing amounts since 1950. The large jump in the year 2000 data is partially due to changes in data collection. Data source USDA. Saturated fats, like those found in butter, are stable. They do not oxidize and form free radicals. Also, certain saturated fats may hold vital keys to cancer cell apoptosis (programmed cell death) and necrosis (inflicted cell death). Lauric acid from coconut oil enhances the killing ability of the immune system hormone tumor necrosis factor (TNF) by 60 times. It also causes the mitochondrial membranes of cancer cells to swell, making them unstable. This further promotes programmed cell death. Another saturated fat also found in coconut oil, palmitic acid, has demonstrated pronounced effects against cancers. Many substances have been studied and labeled as carcinogens or potential carcinogens. The World Health Organization maintains a Carcinogenic Potency Database of hundreds of chemicals that have been determined to possibly or probably cause cancer. Of course it makes sense to avoid contact with these chemicals. Tobacco products would fall into this category of known substances to avoid. There are several insidious carcinogens to worry about. Mycotoxins are toxins produced by molds and fungi. Some mycotoxins are known carcinogens, others can be estrogenic, others can damage organs and impair the immune system. Mycotoxins can sometimes be put to beneficial use, such as antibiotics, but even their use may have profound unintended consequences. Mycotoxins are common in stored agricultural products such as grains and corn, as well as the products made from them such as bread, cereals, and alcoholic beverages. Aflatoxin is a mycotoxin carcinogen that infects peanuts. Many mycotoxins are heat stable or fat soluble so they may not rinse off with water or be destroyed by cooking. A leading theory is that MS is the result of mycotoxin damage. The best way to avoid mycotoxins is to limit cereals, grains, and alcoholic beverages. Rice and oats are safer food choices because they generally resistant to fungal contamination. Exposure to mycotoxins can also result from molds in infested buildings. Vitamin D from sunlight is naturally antifungal, providing another reason that sun avoidance advice for skin cancer may be shortsighted. Researchers in Sweden recently discovered unexpectedly large amounts of the chemical acrylamide in foods rich in starch that had undergone high temperature cooking or processing. Acrylamide is known to cause cancer in animals. It is considered probable that it could also cause cancer in humans. The affected products include such health staples such as french fries, snack chips, chocolate, and doughnuts. High temperature cooking of meats also produces carcinogens known as heterocyclic amines. A possible severe health danger to consider is chronic mercury exposure from common silver amalgam fillings used to repair teeth. Amalgam fillings are composed of approximately 50% mercury combined with lesser amounts of silver, tin, copper, and zinc. Amalgam fillings are very stable mechanically in the hostile environment of the mouth. However these amalgam fillings continually release low levels of mercury that are absorbed through the digestive system and the lungs. This finding is no longer disputed because of the advent of modern mercury vapor measurement equipment. Mercury poisoning is suspected by some as a causal factor in many diseases including periodontal (gum) disease, cardiovascular disease, lupus, autism, multiple sclerosis, Crohn's disease, hypothyroidism, Alzheimer's disease, and cancer. How much mercury do amalgam fillings release and how harmful is this level of continual exposure? The World Health Organization reports that mercury absorption from amalgam fillings typically exceeds all other sources combined, including exposure from consumption of fish, food, air, and water. Amalgam fillings release mercury at an absorbed rate of 3 to 17 micrograms a day. All other sources combined typically add up to less than 3 micrograms absorbed per day. Mercury is one of the most toxic substances to the immune system. Each large amalgam filling contains about the same amount of mercury (1 gram) as in an old fashioned thermometer, a huge amount in terms of what can cause harm. It does not take much mercury exposure to cause severe health problems. The exposure rate may be higher if you have more than the average of 8 amalgam fillings, if you breathe through your mouth, if you chew gum, or if the dental work was recent. Mercury concentrations build over time due to the continual exposure and the long half time (time for the absorbed mercury concentration to return to half of the initial level) of approximately 50 days to eliminate it. In my opinion, the dental care industry is where the tobacco industry was in the 1950's regarding denial of the harm caused by current practices. Mercury is a known enzyme inhibitor, supplanting the vital roles of zinc and selenium in enzyme reactions. It inhibits the body's production of melatonin. It affects the bioavailability of vitamin B12, vitamins A and C, and folic acid. Mercury has an affinity for any molecule that has sulfur in its structure, which is present in all proteins. Heat (consuming hot beverages), pressure (chewing food, chewing gum, grinding teeth while sleeping), and abrasion (brushing and polishing teeth, exposure to acids) cause a significant short term increase in the release of mercury from amalgam fillings. Mercury is primarily absorbed as a vapor by the body through the lungs. Pancreatin enzyme supplementation often reduces allergy symptoms, clearing sinuses so that more breathing is done through the nose rather than the mouth. This may result in less mercury vapor absorption via the lungs. Cancer invariably results in very acidic saliva, which may further increase mercury release from fillings. There are many strategies available to regain immune system functions lost to mercury and toxic metal poisoning. Some of these measures also explain known risk improvement factors for cancer. These include supplementing zinc and selenium to displace mercury in enzyme reactions. Supplementing melatonin is also a recognized effective cancer treatment and prevention measure. Eating green vegetables helps because chlorophyll can chelate mercury. Green vegetables are also rich in the vitamins that may be adversely affected by mercury. Vitamin C, N-acetyl cysteine (NAC), garlic, cilantro, and IP-6 bind with mercury so it can be eliminated. Eating sulfur rich foods and sulfur containing supplements such as MSM can help eliminate mercury form the body. Sweating from exercise or a sauna is another mechanism to eliminate toxic metals. An advantage to sweating is that it does not require the involvement of the liver to filter the toxic wastes. Avoiding certain fish such as tuna can reduce mercury intake to return the balance in favor of mercury elimination. Glutathione made in the body helps eliminate toxic metals such as mercury. Glutathione taken as a supplement does not boost cellular glutathione levels, since glutathione breaks down in the digestive tract before it reaches the cells. Supplements that increase cellular glutathione include ornithine, alpha lipoic acid, NAC, pycnogenol, and silymarin from milk thistle. If you have future dental work, find a dentist trained in minimizing your exposure to mercury. There are problems in removing and replacing amalgam fillings beyond the cost. Amalgam removal can result in severe mercury vapor exposure, potentially doing more harm than good. Therefore, if you have cancer, it is probably wiser to "let sleeping dogs lie" and defer removal until you are well. If you have amalgam fillings, do not breathe through your mouth during dental work. Postpone the appointment if you can't breathe comfortably through your nose that day. There are durable alternative fillings available without mercury. It may be easier for you to ask your dentist to use these alternative white fillings based on their improved appearance. What about skin cancer and alcohol? Moderate alcohol intake helps to prevent mercury absorption, perhaps mitigating some of its detriments for cancer. Moderate wine consumption is associated with reduced cancer risk. Some of this benefit may actually be due to other factors such as resveratrol, a polyphenol found in red wine and grape juice. A recent study with mice found that even moderate alcohol consumption resulted in accelerated tumor growth. The researchers found that tumors in the alcohol-fed mice were nearly twice the weight of tumors in the control mice. When a rodent, or a human, gulps down a drink, the cells in their bodies attempt to get rid of the toxins. The stressed cells send out a hormone dubbed VEGF that stimulates the growth of blood vessels—a tumor’s means of getting oxygen and nutrients to survive. The researchers found the alcohol-fed mice showed a significant increase in VEGF as well as more blood vessels than the other mice. Taking advantage of natural anticarcinogens available in the diet or through supplements is also possible. A good example is the powerful cancer fighting nutrient conjugated linoleic acid or CLA (NOT to be confused with cancer promoting linoleic acid!). CLA stimulates the immune system, inhibits cancer initiation and growth, improves insulin sensitivity, improves blood lipid levels, improves lean body mass to fat ratios, and has no known practical toxicity levels. Meat and dairy products traditionally are good sources of CLA. Modern farming practices have led to a steady decline in the amount of CLA supplied in the diet over the past fifty years. The meat of grass-fed cows contains up to four times as much CLA as cows fattened with grain or corn. Today's dairy products have only about one third of the CLA content they used to have before 1960. Recent trends toward organic dairy products are a big step back in the right direction. One of the requirements for organic certification is having adequate pasture available. However, there have been news reports showing unscrupulous dairies can circumvent the adequate pasture requirement by making access to it more theoretical than actual to "sell for less." Be discerning and prepare to pay more for quality organic food. A case could be made that the cancer, heart disease, diabetes, and obesity epidemics we are now experiencing are largely due to the decline of CLA in the diet. Part of the ancient rationale for avoiding the eating of "unclean" scavenger animals, in addition to concerns about parasites, may be due to the fact that these animals can be expected to supply very little CLA. A disturbingly similar situation is now developing with seafood where farm raised fish are replacing wild fish in markets. Many wild fish naturally include ocean vegetation in their diets resulting in cancer fighting omega 3 oils that may be missing from farm raised fish. Cancer science in the past century has been mostly ineffective because it lacks the foundation of a plausible model, such as the trophoblast model described on this page. Developing a model is the first basic step needed to understand and then effectively address a problem. Choosing a model that describes the condition is important because it leads to effective treatment and prevention strategies and releases us from ineffective strategies. It also provides a context to consider otherwise bewildering research findings. With the trophoblast model, the underlying causes are the same for any type of cancer. This means that treatments found to be effective for other types of cancer should also be generally effective for skin cancers. In the case of skin cancer, instead of focusing on excessive sun exposure, although important, efforts would be better spent on improving the pancreatin enzyme eradication and natural killer cell mechanisms as well as inhibiting growth mechanisms. A model helps us realize that surgery is treating cancer symptoms and is not going to eliminate its causes. A model enables us to steer clear of initially enticing but ultimately disappointing therapies such as protease inhibitors. It should also be recognized that there are other tiers of body's immune system defenses against cancer involving T-cells, interferon, interleukins, tumor necrosis factor, and probably a host of other factors. It is impossible to assign a relative importance to each tier of the system, but I think pancreatin enzymes and natural killer cells are the primary, but mostly unrecognized, lines of defense against cancer. Optimizing these immune systems is very fruitful and is within the grasp of ordinary people. Additionally, several other recognized methods of selectively killing skin cancer cells are presented in the strategies. An argument presented against enzyme therapy for cancer treatment is that is based on a 1900's understanding of cancer so it can't be right because it is too old and unsophisticated. From what I have read, John Beard was a brilliant embryologist and pancreatin enzyme experimenter who came up with a simple model of cancer that precisely matches the disease. It is interesting to note that the importance of stem cells as the starting point of cancer is now gaining mainstream acceptance. Another argument is there is no proof of the effectiveness of enzyme therapy for cancer. First, it needs to be pointed out that five year survival rates in 2005 for many types of cancer treated by the best of conventional methods (surgery, radiation, chemotherapy) are still less than 10%, just as they were 50 years ago. Nearly every one of the more than half million deaths from cancer each year in the US is evidence of the inexplicable failure rate of standard treatments, yet alternative treatments are usually not considered. I believe this is a result of the "accepted" cancer model (whatever that is) being flawed or too complex to be useful. The proof of the value of John Beard's model is the success of thousands of people using it over many years to prevent and treat a variety of cancers. The author of the book One Answer to Cancer, Dr William Kelley, is a survivor of cancer of the pancreas in the 1960's (current 5 year survival rate of about 4% or less with conventional treatments). He claimed to have about an 93% success rate treating thousands of cancers over several decades. One factor limiting his success is that often people would come to him in extremely poor condition after exhausting conventional treatments. Another factor was the intense opposition to his work, in part because he was a doctor of dentistry and not medicine. Dr. Kelley's enzyme based cancer therapy was denounced for decades despite its incredible success by mainstream medicine and by organizations such as the American Cancer Society. Dr. Kelley's work has been continued by the accredited Dr. Nicholas Gonzalez who reviewed Kelley's records and found terminal cancer patients alive and healthy years after they should have been dead. Dr. Gonzalez and Dr. Linda Isaacs of New York have continued to validate enzyme therapy with peer reviewed publications of successful treatments (Nutrition Cancer, Gonzalez et al, 1999). I found out about the healing power of pancreatin enzymes before becoming aware of them. I have used pancreatin enzyme based treatments successfully on two potential skin cancers. On the first lesion recommended for a biopsy by a dermatologist as a probable squamous cell carcinoma, I used a topical pancreatin enzyme preparation (actually a mosquito bite remedy) that I more or less stumbled upon by the grace of God. I investigated the ingredients only after observing healing. On a second lesion with skin cancer symptoms, I included oral pancreatin enzyme supplements along with several other strategies based on the three necessary factors found in Dr. Kelley's book. In both instances, healing progress was noticeable within a few days, fairly complete healing took several weeks. It has now been about ten years since successfully using these treatments. From these experiences, I have detailed many free or inexpensive, easy-to-try home remedy strategies in the next sections. I believe it is possible to effectively fight skin cancer based on the three necessary factors for cancer to exist. Applying the first of these factors is to avoid genetic damage to the stem cells in the body. Second is to remove or mitigate the effects of the hormones of pregnancy such as estrogen from stimulating cancer growth. Applying the final factor is to boost the ability of the immune system to fight cancer with its most powerful weapons, namely digestive enzymes and natural killer cells. Part of the optimism for natural healing is because skin cancers present unique opportunities for treatment compared to other cancers because the tumors are accessible. The next section looks at effectively and holistically applying this theory specifically to the most common skin cancers, squamous cell carcinoma and basal cell carcinoma.